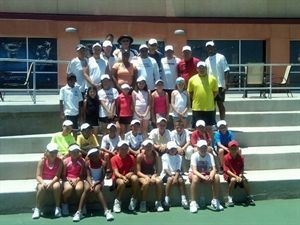 Twenty four of USTA Southwest's most promising junior players, as well as top coaches from the Section were a part of a Section Regional Training Center Camp designed to test, assess and identify talented juniors as well as to promote the USTA coaching philosophy and progressive teaching model. The juniors in attendance at this	three-day camp, which took place at the Surprise Tennis & Racquet Complex	ran through various fitness tests, on-court skills and drills, matchplay, video analysis, and assessments	from Section and national coaches, including USTA National Coach (and former world Top 10 in singles) Lori McNeil and Geoff Russell. Russell was the former Executive Director of USTA Central Arizona, and was recently promoted to USTA Manager, Talent ID & Development. There are currently 12 Regional Training Center programs across the country. The next Regional Training Center held in	the	Southwest will take place in	Sedona, July 9-11.